I took my first cruise on American Cruise Lines was August 2014. I took the Columbia/Snake River cruise. It was on the Queen of the West. It was one of the best vacations that I have taken. It was fantastic. The service & personnel was excellent. I had a lot of fun. Even though I was solo traveler, I felt so welcome & met a lot of very nice people. The food was very good. I would recommend this trip. I would like to take another vacation with American Cruise. I plan to in the near future. Situated between the sparkling waters of the Columbia and Willamette Rivers, Portland has flourished throughout history with the fortunes of the great rivers. In the golden age of riverboats, sternwheelers crossed Portland’s busy waterfront while steam whistles and calliopes rang out across the water. Today, big city excitement combined with small town charm makes Portland one of the favorite destinations in the West. Highlights include the Portland Art Museum, the International Rose Test Garden and famous Powell’s Bookstore, filling an entire city block. A nationally significant historic region at the western end of the Lewis & Clark Trail, Astoria is the oldest American settlement west of the Rockies and today showcases more than 70 Victorian-era homes in its unique historic district. In the winter of 1805-06 the Lewis & Clark Corps of Discovery Expedition was headquartered at Fort Clatsop. In 1955, a replica of the fort was built near the original site and was eventually named a National Monument. Get a comprehensive overview of the Corp’s entire expedition at Fort Canby and the Lewis & Clark Interpretive Center. 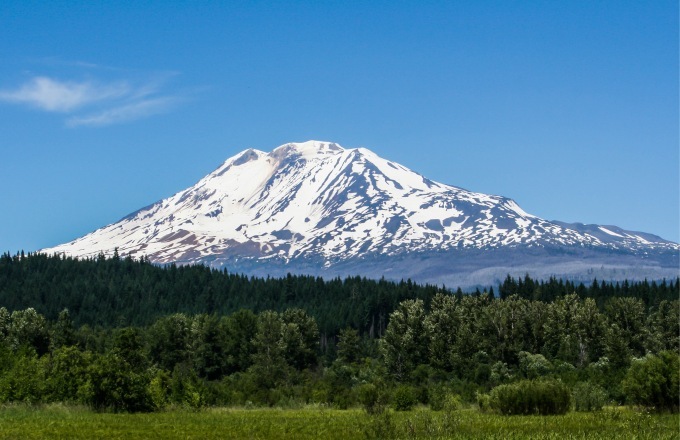 Cruise through Volcano Alley on the Columbia River with views of Mt. Hood, Mt. Adams and Mt. St. Helens. From Rainier, you will travel to Mt. St. Helens National Volcanic Monument. At the nearby observatory and interpretive center, look right into the volcanic crater with its steaming dome, and witness firsthand the destructive power and damage caused by its volcanic blast in 1980. The Columbia River Gorge is a spectacular river canyon cutting the only sea-level route through the Cascade Mountain Range. A popular recreational destination, the gorge holds federally protected status as a National Scenic Area called the Columbia Gorge National Scenic Area and is managed by the United States Forest Service. The cliffs of the awe-inspiring gorge look down on quaint riverfront towns and exhilarating windsurfing waters. Through millenniums of geologic events, waterfalls have found their home in the Columbia River Gorge. In the heart of the Columbia Gorge National Scenic Area, the ship will move through and transit the Bonneville Lock and Dam to reach the port of Stevenson. At the Bonneville Dam Visitors Center, learn about the workings of the massive turbine generators behind this imposing hydroelectric power source. The Columbia Gorge Interpretive Center showcases the area's unique cultural and historical diversity, from the Native American tribes that inhabited the Gorge, to Lewis and Clark and 19th-century loggers. Journey to Pendleton and get a taste of the real West watching working cowboys at the world-famous Pendleton Roundup and learn about the pioneers from the perspective of the Native Americans at the Tamastslikt Cultural Institute. This unique town began to thrive in 1851 with the establishment of a European-American commercial trading post and today it offers visitors a true view of the original American west. The twin cities of Lewiston, Idaho and Clarkston, Washington, are known as the Northwest’s most inland seaports. Here, along the Snake River, you’ll find Hells Canyon, the deepest canyon in North America. This canyon is known for its pristine wilderness and breathtaking scenery. View ancient Indian petroglyphs and magnificent wildlife. A deposit of $500.00 per person is required to confirm any reservation on trips of 9 nights or less, and a deposit of $900.00 per person is required to confirm any reservation on trips of 10 nights or more. Final payment is due 90 days prior to the sailing date. Any Reservation made within 90 days of the departure date must be accompanied by full payment and is subject to Cancellation Terms. Contact American Cruise Lines, Inc. for additional deposit and payment information concerning groups. Complimentary cocktail parties, and entertainment aboard the ship. * All refunds will incur $250.00 per person charge. The cancellation fees of $250 per passenger may be applied as a courtesy discount toward fare for a future cruise reserved with American Cruise Lines, Inc. within one year of the cancellation date. Fees paid for the American Cruise Lines Cruise Cancellation Protection Plan are non-refundable. For cancellations relating to group bookings, passengers should refer to the group booking agreement for terms and conditions.